Thanks to Donald McKay Frost, AAS owns a complete run of the second newspaper printed in the Dakota Territory, preceded only by a paper of the same title issued at Fort Union the previous summer. Located in south central North Dakota, Fort Rice was a 500-foot square wooden stockade erected in the summer of 1864 to protect vital transportation routes from increasingly frequent Lakota attacks. 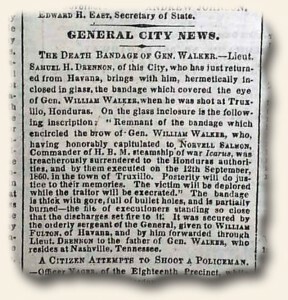 Initially it was manned by “galvanized Yankees” — former Confederate prisoners of war who had enlisted in the Union Army rather than wait indefinitely in prison camps for parole or exchange. 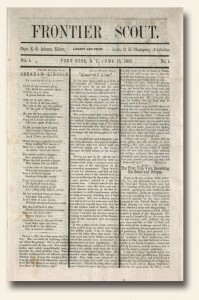 In order to ward off the stress of isolated frontier living, the soldiers engaged in various diversions, including theatrical performances and the publication of their own newspaper printed on a portable press. 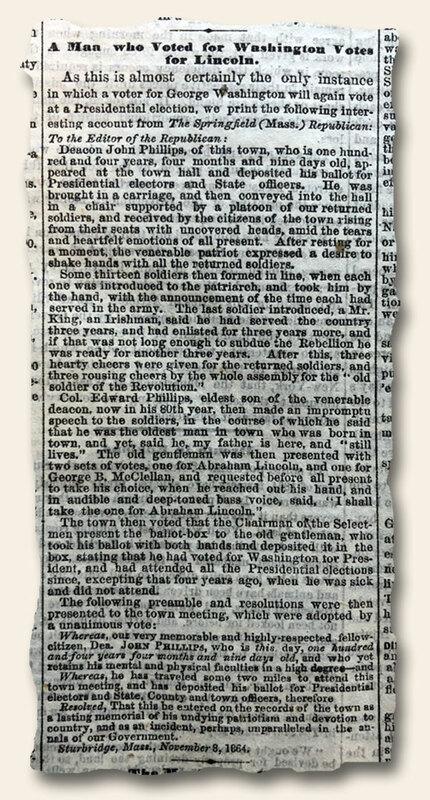 Captain E. G. Adams and Lieutenant C. H. Champney of the First United States Volunteer Infantry Regiment served as editor and publisher respectively. 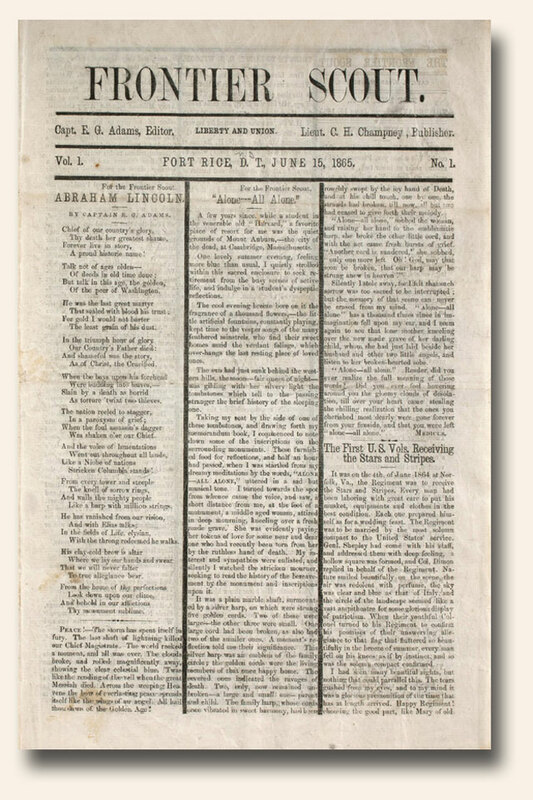 In this inaugural issue, Adams encouraged the troops to contribute poems, stories, and adventures. 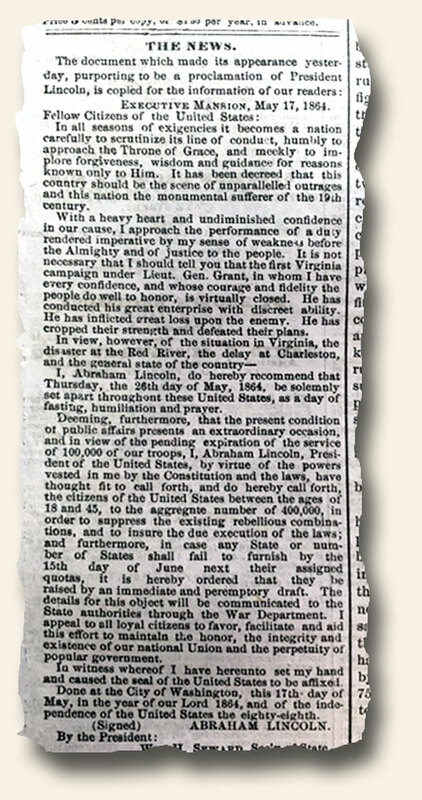 “When this is done our paper is formed, a living, speaking, embodiment of the society in which we dwell.” The last of the fifteen weekly issues appeared on October 12, 1865, shortly before Adams and Champney left the fort. 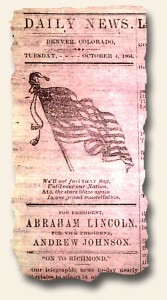 Most issues were printed on sheets of ruled blue ledger paper.